NEWCASTLE UPON TYNE, ENGLAND--(Marketwire - Oct 26, 2012) - Grand meetings and events are accompanied by grand opportunities to save money and create an affordable gathering at a prominent conference hotel in Newcastle where two special deals await those looking to book an event in the near future. Boasting stylish conference spaces and 17 meeting rooms, the Newcastle Marriott Hotel Gosforth Park can accommodate up to 600 guests in its elegant Grandstand Suite or break it down into four units to combine with its 861 total square meters of state-of-the-art facilities to meet the needs of corporate clients and business executives. And, with two great meeting packages currently offered, savvy event planners are sure to find everything needed for an impressive gathering while saving money to boot. Make 2013 Lucky - Event planners can save 13 percent on delegate rates and earn Marriott Rewards points simply by booking an event to be held during the first three months of next year before January 15, 2013. Starting the New Year off right with a stylish event that allows executives, associates and clients to get down to business, the comprehensive event services of this Newcastle conference hotel will set the pace for success whether planning a company board meeting, corporate dinner, professional trade gathering or social occasion. Rewarding Events - While a successful event is a reward in itself, this generous offer from one of the premier conference hotels in Newcastle upon Tyne allows event planners the opportunity to double their Marriott Rewards when booking meetings between now and January 31, 2013 for events to be held by May 31, 2013. Allowing up to a maximum of 100,000 points per event, this deal is a great way for company executives to earn points that can be redeemed at Marriott properties worldwide for exciting vacations, weekend escapes, meeting credits, spa retreats and so much more. As a stylish hotel near Newcastle Airport, the Marriott's Gosforth Park lodging offers a perfect environment for hosting meetings and events. Fully prepared to provide guests with exceptional service whether planning a small or large convention, the Marriott's renowned service sets the standard for gracious hospitality, superb attention to detail and meticulous accommodations. Dedicated event organisers and professional catering with regionally inspired menus set the pace for a remarkable gathering. The Newcastle Marriott Hotel Gosforth Park sets meticulously on 12 acres of parkland and is one of the most stylish luxury hotels in Newcastle City Centre, providing guests with easy access to the district's vibrant atmosphere while surrounding them with contemporary designs, gracious service and a host of on-site amenities. Fine dining accompanied by live entertainment on select weekends is offered at the hotel's own Plate Restaurant, while a more relaxed atmosphere can be found at the Chats Café Bar. The hotel also offers tennis and squash courts, a heated indoor pool, well-equipped fitness center and the Beauty at Gosforth Park Spa. 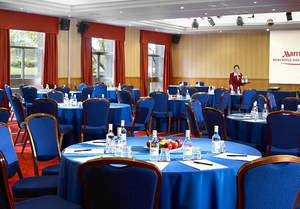 Boasting stylish conference spaces and 17 meeting rooms, the Newcastle Marriott Hotel Gosforth Park can accommodate up to 600 guests in its elegant Grandstand Suite or break it down into four units to combine with its 861 total square meters of state-of-the-art facilities to meet the needs of corporate clients and business executives.